Annabelle wants a DOG but she has her CAT, Pepper. When Annabelle asks for a dog, her mother tells her, “No, Pepper will have to do.” So, Annabelle decides to see if Pepper can be like a dog. The more Annabelle tries to make Pepper be like a dog, the funnier it gets for both Annabelle and Pepper. At the end of a loooong day, Annabelle discovers what Pepper really is! 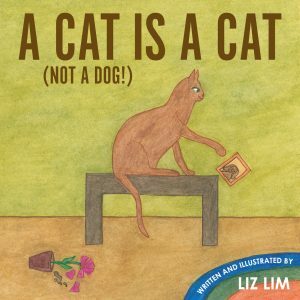 Liz Lim is a mother, a teacher, and a writer. A lover of picture books as a child, she spent many happy hours immersed in them. When she became an elementary school teacher, she carried this love of picture books into her classroom believing that some of life’s greatest lessons can be learned from them. Besides writing and teaching, she enjoys life playing badminton, exploring personal development workshops and walking her dogs. She currently lives in Calgary, Alberta with her husband and two dogs. She has many warm memories of sharing picture books with her four children. Her hope is that her books will help others create those memories too! “A Cat Is A Cat (Not A Dog! )” is the second book she has written and illustrated. “My Special Sound” is her first book.